Wednesday, March 27, at 7 p.m. or Thursday, March 28, 9 a.m.
Wednesday, May 15, at 7 p.m. or Thursday, May 16, at 9 a.m.
Wednesday, August 21, at 7 p.m. or Thursday, August 22, at 9 a.m. The Grandview Heights Schools district newsletter is mailed to all residences in Grandview Heights and Marble Cliff to inform, raise awareness, and increase communication with the community. Download the pdf and learn more about the district's Facilities Master Plan. With the passage of Issue 6, Grandview Heights Schools has created a webpage to keep our community updated on the progress of our Facilities Planning Process. Right now, we’ve entered into the design phase where community members, staff, families, and students will help us with the design of our new and updated school buildings. In December, the Board of Education passed resolutions authorizing the school district to enter into contract negotiations with the architects and construction firms that will design and renovate Grandview Heights High School, build a new Edison Intermediate & Larson Middle School, and make safety and accessibility updates to Stevenson Elementary. Moody Nolan, a local architectural firm, will be teaming up with Perkins+Will, a nationally recognized firm specializing in educational facilities, to design the buildings. Elford Construction and Corna Kokosing will oversee the construction and renovation of our schools. We look forward to our new partnerships and the work ahead as we begin to make much needed safety, security, and ADA upgrades and improvements to our learning spaces. Over the next year, we will be conducting the Design Phase of the Facilities Plan. There are four stages of the design process: Program Design; Schematic Design; Design Development and Construction Documents. These stages must be completed to determine the final design and costs of the project, and must be completed before the actual construction of the facilities can begin. As we enter into the important design and construction phases of this process, we want you to continue to “Join the Conversation.” Please visit this website to stay informed on the progress and any future meetings regarding the design and construction of the school buildings. We will also be sending out newsletters, mailings, and emails about the project to keep our community updated. If you have any questions, please feel free to email superintendent@ghcsd.org. Thank you for your continued support of our schools and students. The Building Design Process has four stages: Program Design; Schematic Design; Design Development; and Construction Documents. These stages must be completed to determine the final design and costs of the project and must be completed before the actual construction of the facilities can begin. Below please find information and presentations related to each of the four stages. 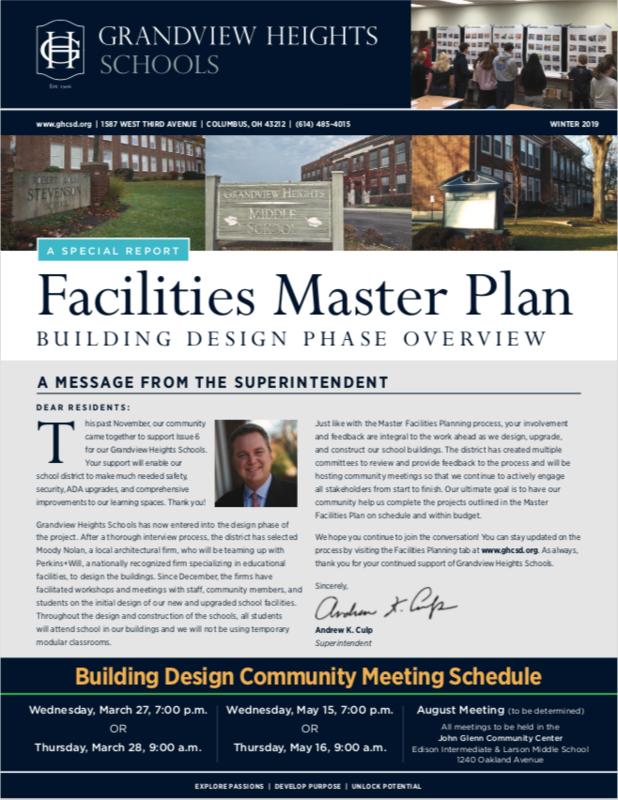 At the bottom of this page, download a copy of the Winter 2019 District Newsletter - A Special Report to learn more about the building design phase of the Facilities Master Plan.